Article reproduced with the kind permission of Nelson Provincial Museum. On 24 November 2010 Nelson Provincial Museum launched the Glass Plate Negative Project. The aim of the project is to relocate over 150,000 glass plates negatives from mobile shelving into new industry standard drawers. As part of the process the plates will be digitally photographed and information about each plate electronically recorded for use in the Museum’s collection database. The GPN project team reached a fantastic milestone on Thursday 28 June 2012 with the digitisation and relocation of the 50,000th glass plate. The plate, referenced Aldridge, Miss, Tyree Studio Collection: 22588, represents one third of the Museum’s glass plates being relocated and digitised. This is a significant milestone for the Museum and for the ongoing preservation of the region’s photographic heritage. The project team have now relocated and digitised 50,463 glass plates from the Museum’s collections. The data collected from nearly half of these digitised plates has been verified and imported into the Museum’s collection management system. This has resulted in 19,000 records now accessible online through the Collections Online website. Plate 50,000 – Who is Miss Aldridge? The Tyree Studio glass quarter plate negative of Miss Aldridge is the 50,000th photographed in the Museum’s Glass Plate Negative Project. But we know nothing about her. Who was she? What was she doing in Nelson? How did she come to be standing in the Tyree Studios, having her portrait taken? Miss Aldridge also represents the difficulties of researching many of these early portraits where only minimal information has been retained. Most nineteenth century studio photographers only recorded the surname of the person being photographed. Occasionally a first initial is included and rarely a first name. In this case the use of her title suggests that Aldridge is her maiden name. Photographers’ indexes also rarely record dates and so we are unsure when the photo of Miss Aldridge was taken. The Tyree Studio began in 1882 but it continued right through until 1947. Although some tentative dating can be achieved with Tyree half, 6 x 8 and 8 x 10 plates, the photographers left no dating clues for quarter plate-sized negatives. Dating from the clothing worn is also a difficult venture. 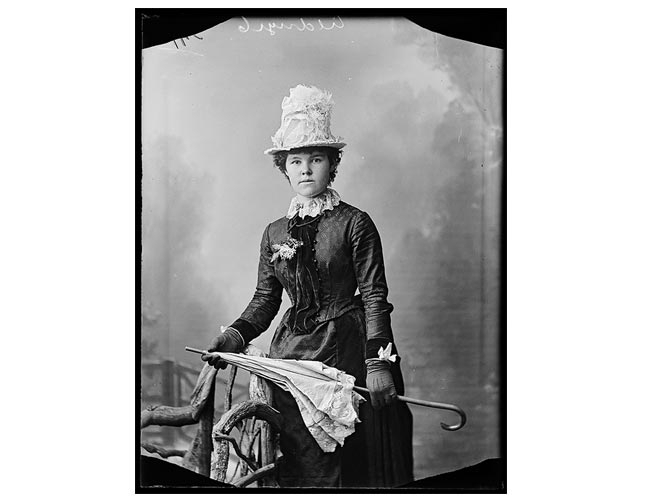 Miss Aldridge’s clothes suggest this photo was taken in the 1880s but while the introduction of fashions can be traced, when people stopped wearing them is much more difficult to judge. Miss Aldridge has dressed for the camera but she may be wearing a brand new dress or one she has had for many years, she may even have borrowed it for the occasion. Casting the net further and reaching into the bounds of speculation may be interesting but provides no further concrete insight. Although there are a significant number of images of people with the surname Aldridge (or Alldridge) in the Museum’s collection, Aldridge is not a particularly common name in Nelson; only five families are listed in the 2012 Nelson telephone directory. Several early Nelson Aldridge families deserve mention. A gold miner named Aldridge is reputed to have been the first European to ever walk the Heaphy track. Another famous local personality was Michael Aldridge, a whaler based in Port Underwood from 1838. His son John became the proprietor of the Tua Marina Hotel and had one daughter. Another Aldridge family ran the Tophouse Post Office in the early 1900s. Mr and Mrs George Aldridge had seven daughters and one son. Whether Miss Aldridge is related to any of these families is unknown and possibly, her history may never be known. Cyclopedia Company Ltd. (1905) ‘Port Underwood’, The Cyclopedia of New Zealand. The Cyclopedia Company Ltd: Christchurch. Tomlinson, J. E. (1983) ‘The Tophouse Telegraph and Post Office’, Journal of the Nelson and Marlborough Historical Societies, 1(3); 35. 1. 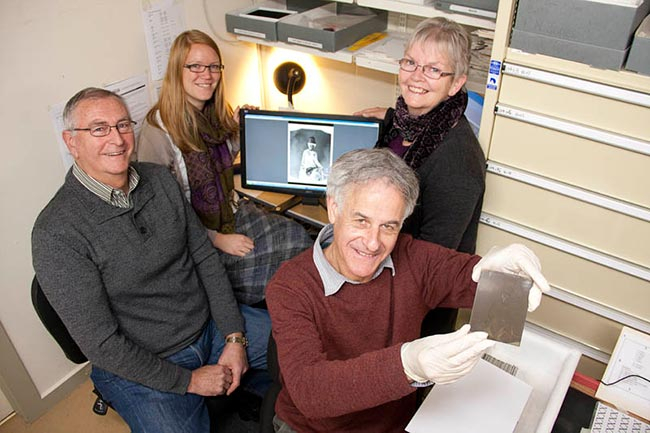 Errol Shaw holds the 50,000th glass plate to be digitised and relocated as part of the Nelson Provincial Museum’s Glass Plate Negative Project. Pictured with Errol are fellow project team members (from left) Ian McGuire, Megan Wells and Anne McEwan. Image courtesy of Nelson Provincial Museum. 2. Aldridge, Miss, Tyree Studio Collection: 22588. Image courtesy of Nelson Provincial Museum. The Tyree brothers were well-placed to take advantage of new photographic technology and put it to use taking scenic photographs around the region. Thanks for sharing. What a great milestone and fascinating explanation to go with it! Wonderful, what an achievement. The glass plate negative being held up looks like a collodion wet plate negative. As a member of the Stallard family of Nelson, am presently trying to source names for six Tyree mounted photos of family – probably of Field/Wratt (old Nelson/Marlborough)families. One photo of a woman is posed very much like that of Miss Aldridge and dressed similarly. Visiting Nelson in March 2013 – hope to search records at your Museum. Previous Post: Otago's best kept secret exposed!